Seems to have been a particularly good month for playing with the brush pen, although it does seem that the Noodlers ink I put into it last is not entirely coming through the bristle "nib". 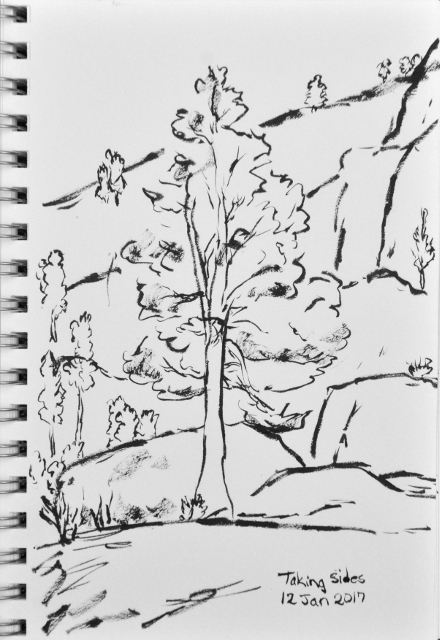 Some trees on either side of a narrow bit of canyon of Pinnacles National Park. A rather over-filled Lake Sonoma. 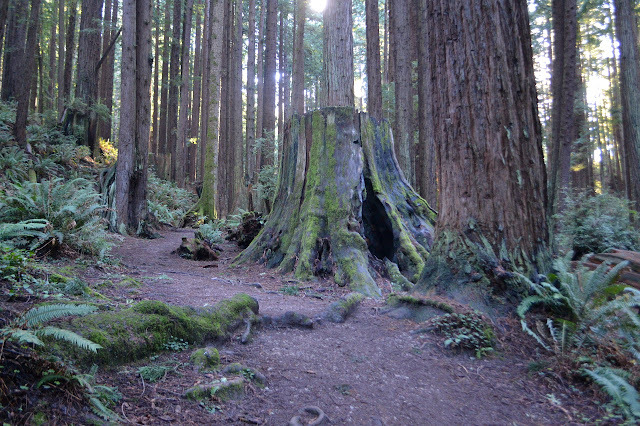 Big stumps turn into planters in the thick forest. 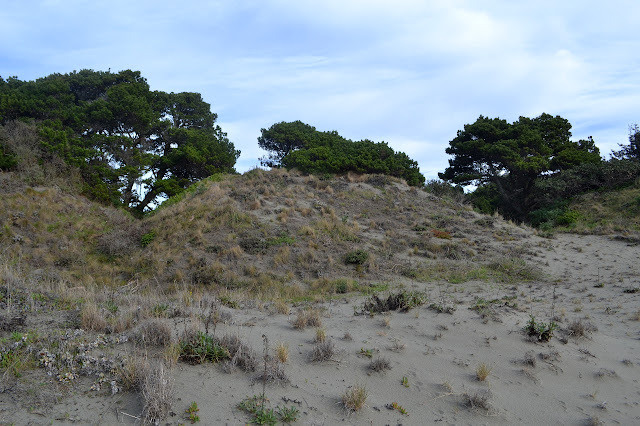 A sandy section of sand dunes that are generally held by invasive beach grass. 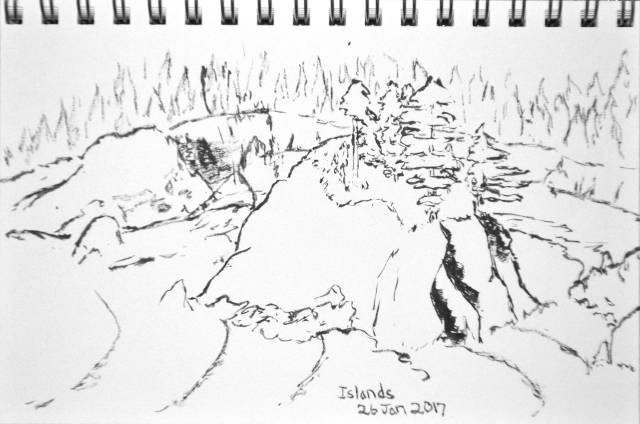 Sitting up on top of Ceremonial Rock on an enjoyable day for a favorite sketch of trees and ocean. Back to see Pewetole Island again. 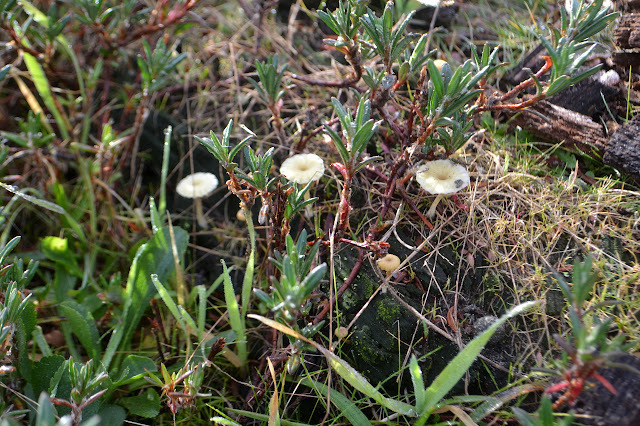 Some mushrooms among the sand dunes. 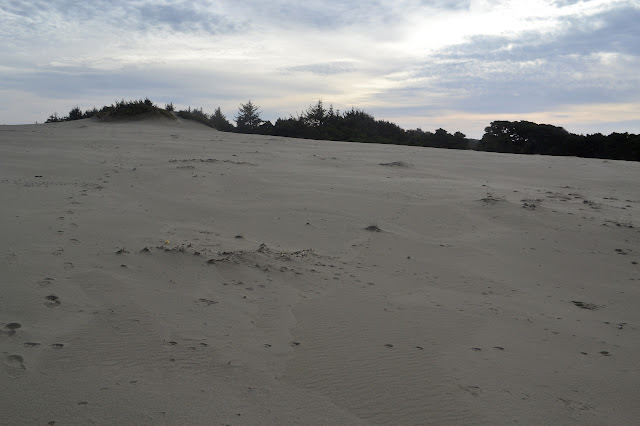 There is one more section of dunes to visit along this long spit of sand. 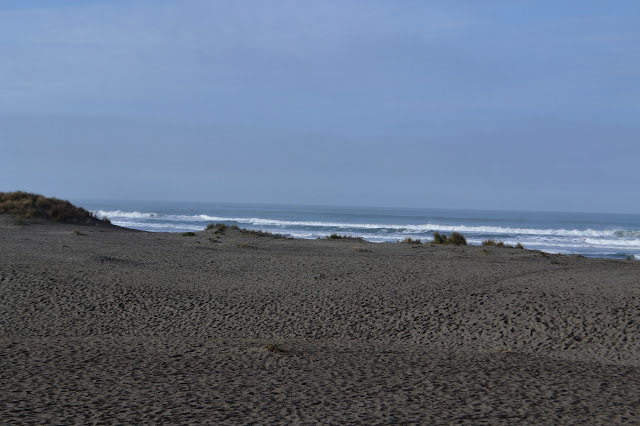 I figured it would be quite interesting to visit the very end of it where jetties keep the channel open for entry to Humboldt Bay. This area is actually an open area for off road vehicle travel but also sees a lot of hikers. Signs have recommendations for how to reduce friction between these two user groups. Today, there is plenty of off road travel, but it is almost all directed at getting surfers as close to the end of the jetty as possible. A nice picnic area on the bay side of the dunes. The big, apparently old trees are in lines boxing in each site. They were planted. 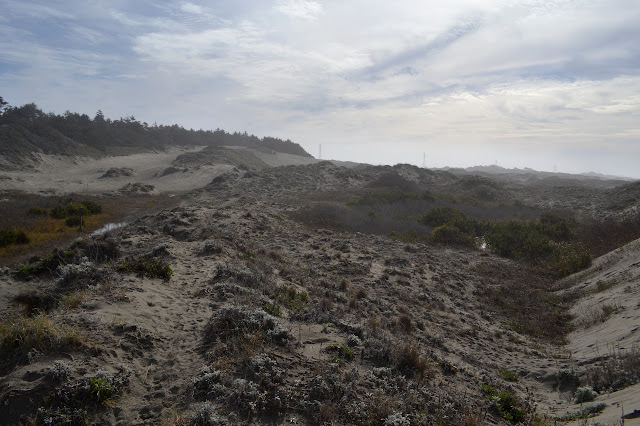 A clear trail leads up and down over the last row of dunes beside what would be a flat, sandy beach except that it ends in a wall rather than water. Water is splashing over one spot even though the tide is currently not very high. Looking across the bay as the wall gets another little splash. 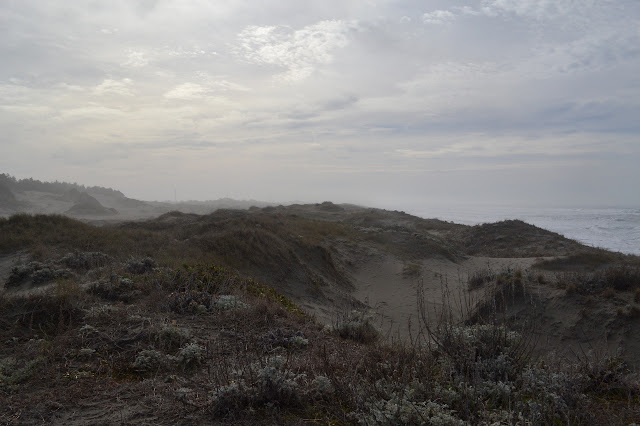 I headed a little further down the sand that cuts off the bay from the ocean for more sand dune adventures. 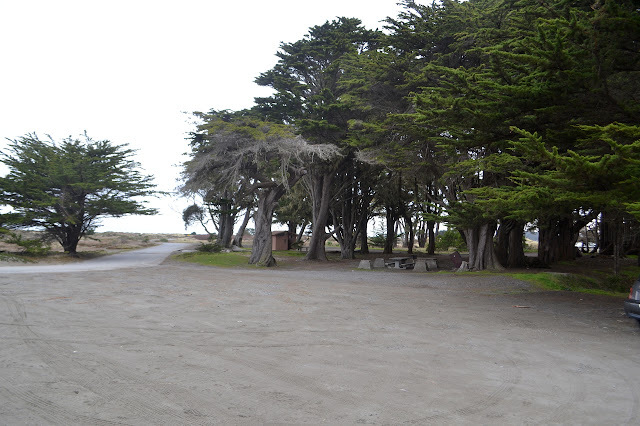 For Ma-le'l Dunes, parking is on either side of the gun club with a bit of fenced off area in between. Lots are locked a half hour after sunset to sunrise and the north side is only open to the public Friday through Monday. The map shows established trails, but keeping to these can be difficult. Plenty of other trails exist and this time of year, the established ones have a tendency to be under a bit of water. There is a bit of sandy hills topped in brush. The low spots often have no drain so there are plenty of pools in this wet winter. 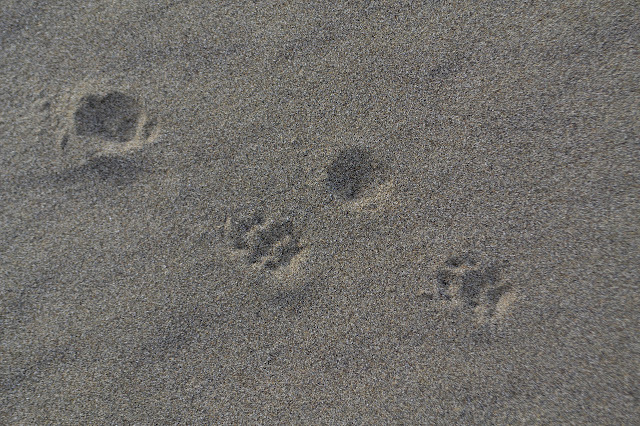 A good place for tracks, but most of them are dog or human. After a little false starting finding myself with pools to cross that were difficult to deal with because anyone going that way started at a different spot in the parking lot, I find myself wandering southerly on a main trail that has easy bypass spots for the deep pools. There are some quite pretty trees hung in Spanish moss. 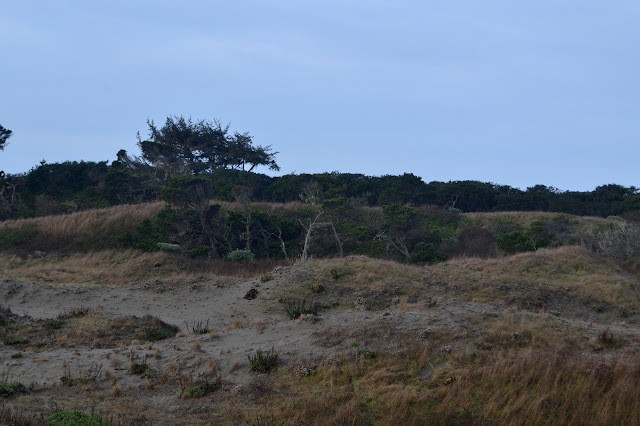 The gun club is an active place over there past the trees and down the other side of the sand. Some brush is established in the low spots and currently swimming in pools as well. Maybe I will not go this way after all. 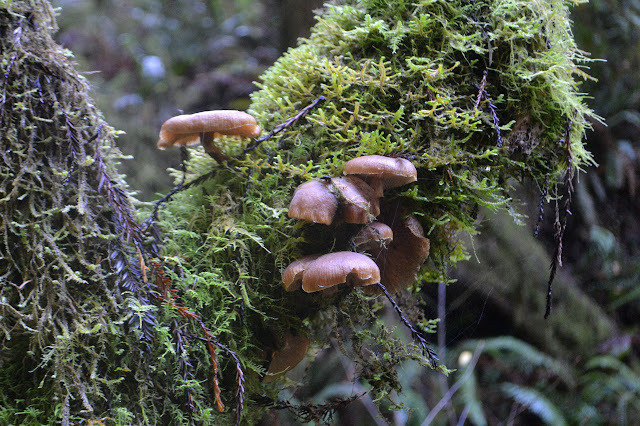 Once on the main trail, it is easy to just get into traveling, but there are some little things it is nice to take in. Plenty of big things, too. 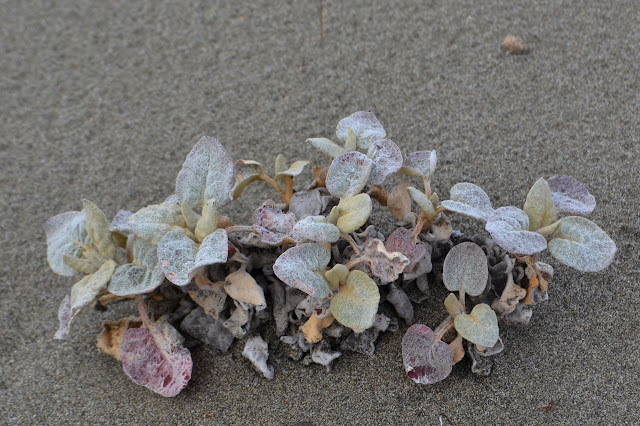 A log in the sand hosts quite a bit of growth. 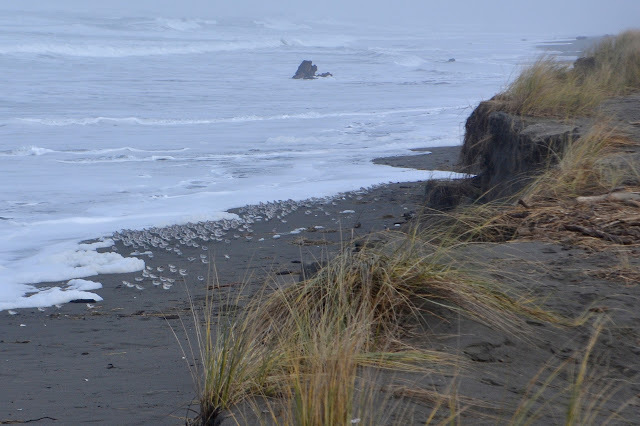 Over the dunes and to the crashing waves. Someone has written, "Welcome to the eternal now," on a large cement piece and the waves do seem to create that feeling even as they create a sort of ticking of time. The dunes stretch on and on. A sign marks the edge of BLM land and the start of Friends of the Dunes where there is another collection of trails winding up and down the dunes. At a particularly large bit of lake on a junction between trails, I go for something going a little higher than what I have been on. 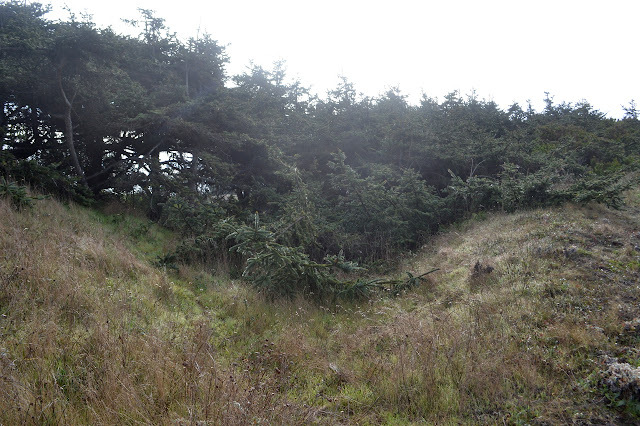 Low and twisted fir trees top the hill beside the trail. I can see Manila below. It has a base and I seem to be getting close to it as there is fencing out into the dunes. That is the end of my southerly travel for now, so I wander down to the beach to return. The tide is high and there is easy walking on the shelf above the beach, so I stick to that slightly higher land. Each wave may be a tick, but they are so drawn out that five or six tick at once and a few ticks come from a different clock. It does feel like an eternal now. 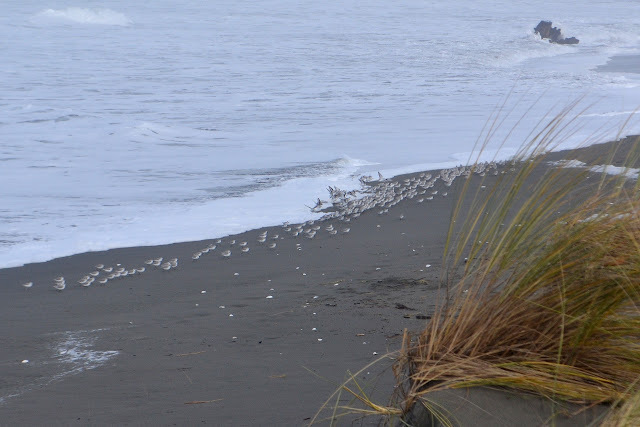 I watch the little sand pipers for a moment as they dance with the waves. They become a line running from each wave as it comes in the last few feet. 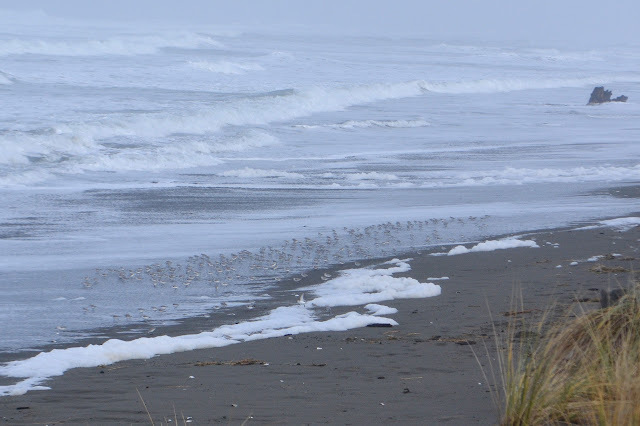 As falls back into the ocean, they rush it, flying over the foam left on the beach and into the water to grab their food. 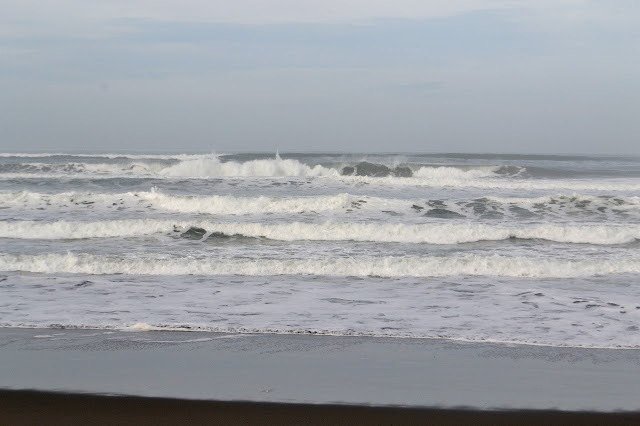 When the waves are far out, they are scattered all over the beach until a new wave comes up high and sorts them again into a line leading the edge up the beach. Collected into a tight group by the last wave, the sandpipers all turn to it as it starts to fall back into the ocean. The attack and feeding once the wave is in retreat. Sometimes those sandpipers find they are somewhat rushed by an unexpected motion of the wave as it comes in. 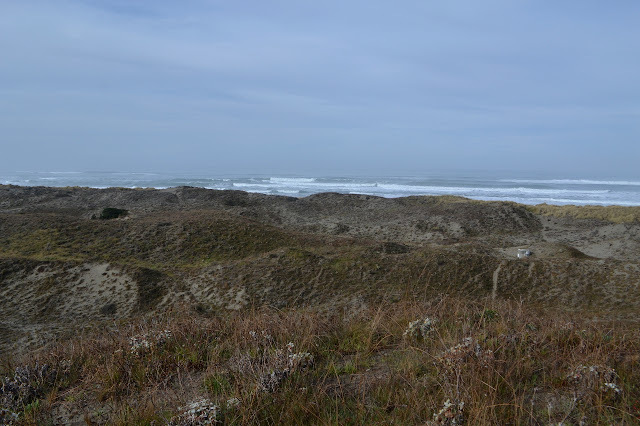 Eventually, I take to the dunes again and continue northerly along some high trail. The gun club sings and no one seems to worry about it. More people are playing in the dunes as the day gets later. There is fencing blocking further movement in this direction too. 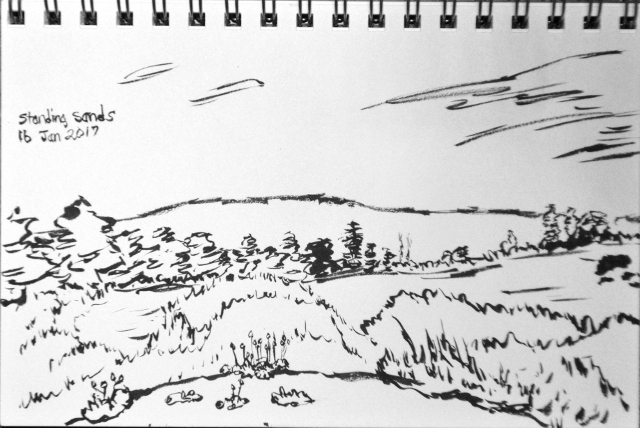 Another look out over the sand dunes. 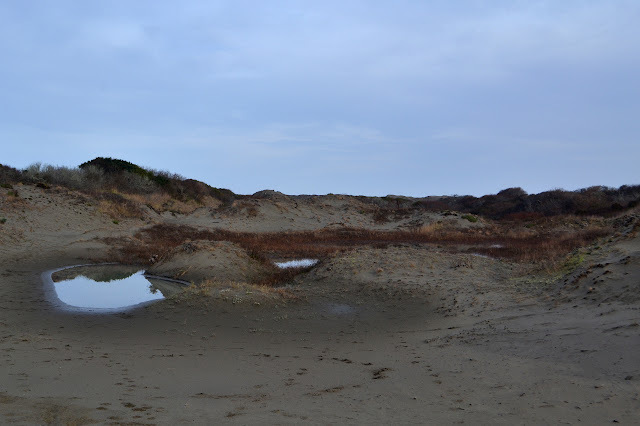 Still battling pools along the trails through the sand dunes beside the gun club. 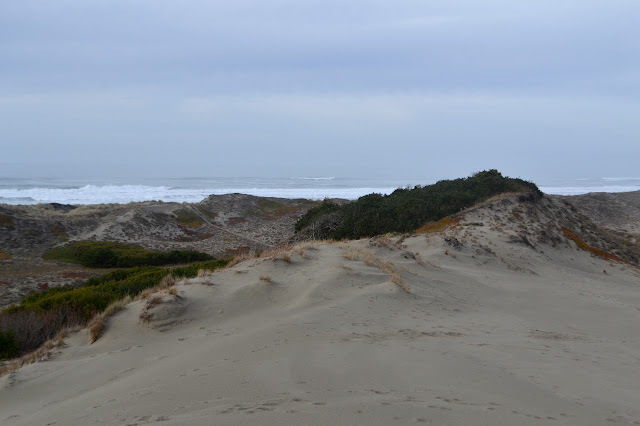 It is a short drive south along the road to access more dunes south of the fences. The access is at the Community Center and signs show another set of trails. 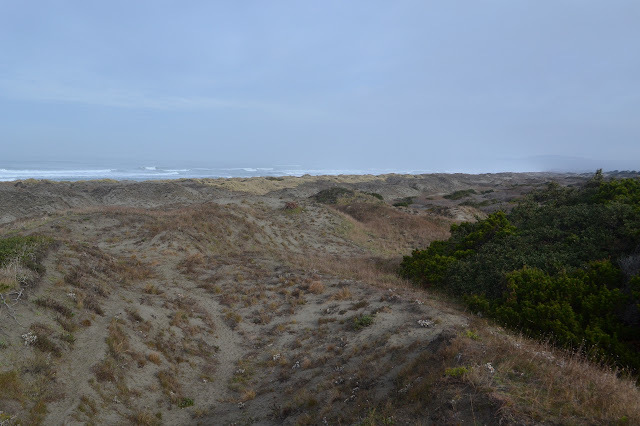 Signs also point out efforts to eradicate invasive plants and point out that most of the grass on these dunes is an invasive English beach grass that stabilizes them much more effectively than the native dune grass. There are also photos of four rare area plants that you agree not to step on (or so the sign hopes) when using this area. Back on the beach with a few oyster shells and a little drift wood and very little else. Starting down a trail and finding nothing looking particularly official other than continuing down this one quite wide stretch, I find myself on the beach again. The tide is going out, so I stroll along on the sand this time as I head southerly. 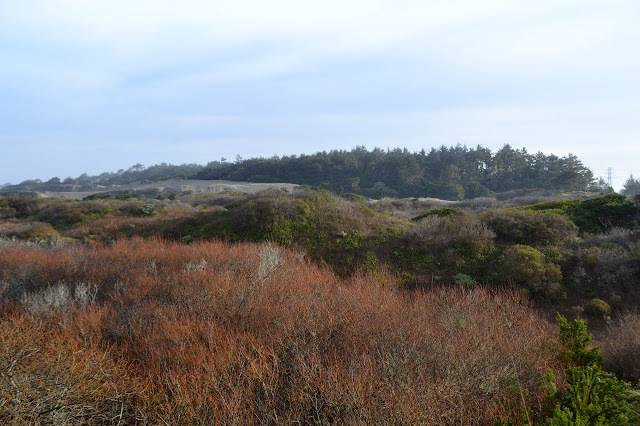 A low spot in the cliffs leads to trails around on the dunes again. A low spot in a hill also leads to a trail, which is handy for traveling through the lush growth on the other side of this hill. 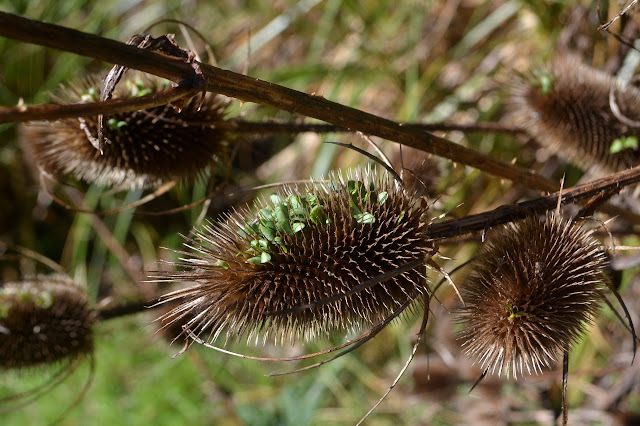 These seemingly common plants often reward a close look. Just two sets of footprints and numerous animal tracks once a fair distance from the Community Center. The ever present ocean continues to pound the beach. 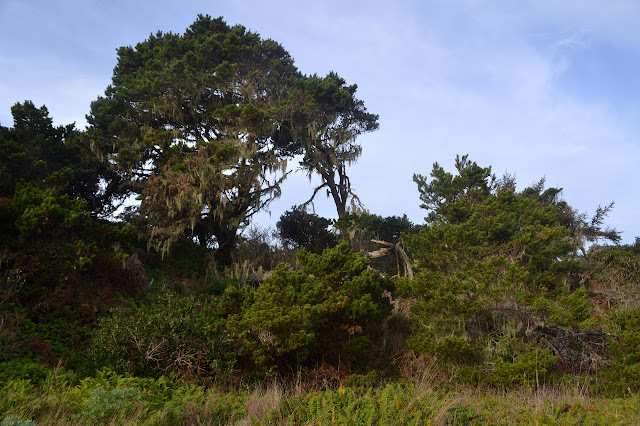 Coming back does seem to be on a smaller trail that may be unofficial, but it passes by a dilapidated circle of interpretive signs at the top of a dune. The platform they stand on looks unsafe, so they are fenced off. Someone must have decided that they could not keep up the repair of this display, but there is more information on these signs (somewhere underneath the graffiti) that is not presented below. 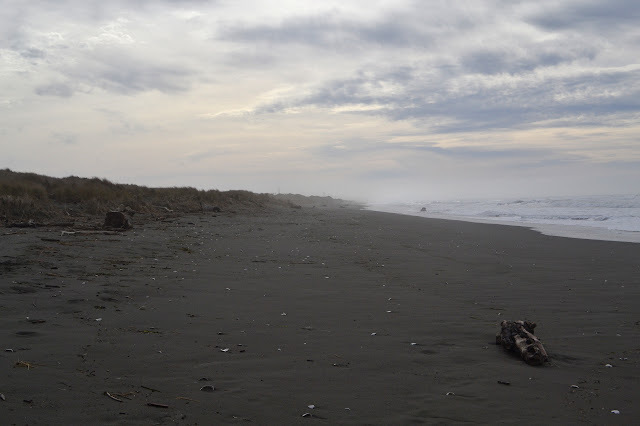 Tend to the right at the end of Main and keep on to the end of the road to park in the tsunami zone in Trinidad to hike around the large headland that looks a bit like a large island in the mist when viewed from down by the Mad River. The gated road continues on up the rock. There are also some steps up to the road on the other end of the parking area, which is what I head up. 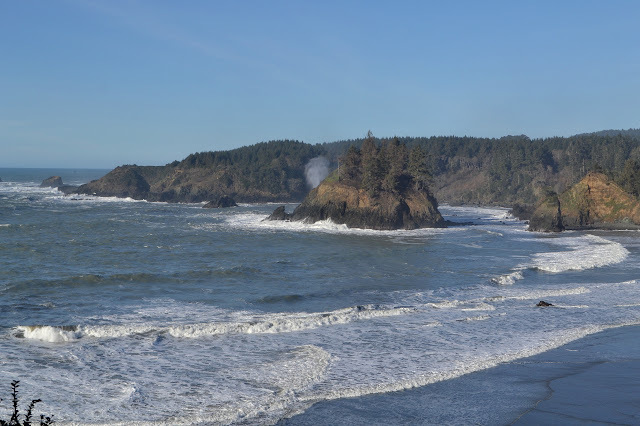 The tide is a little higher and the waves a little more pounding so the island spout is going. A short way up, a trail splits off from the road and a sign describes the loop. Of course, I head for the trail. It is carved out of some very thick growth that leaves little chance to actually see the views. To combat this, viewing spots are carved out at frequent benches along the way. I am surprised to see a couple rabbits along the way as I go. 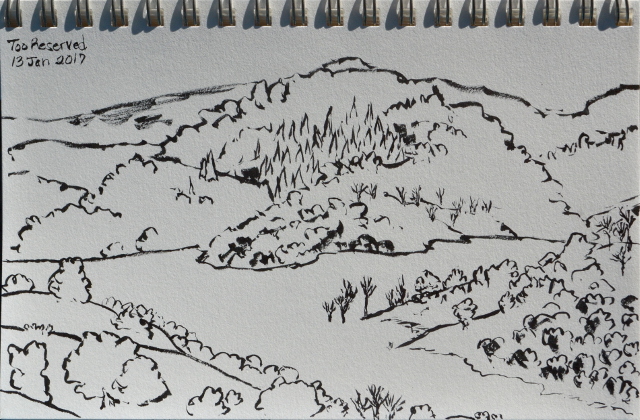 A little bit of view carved out of the generally view blocking brush. 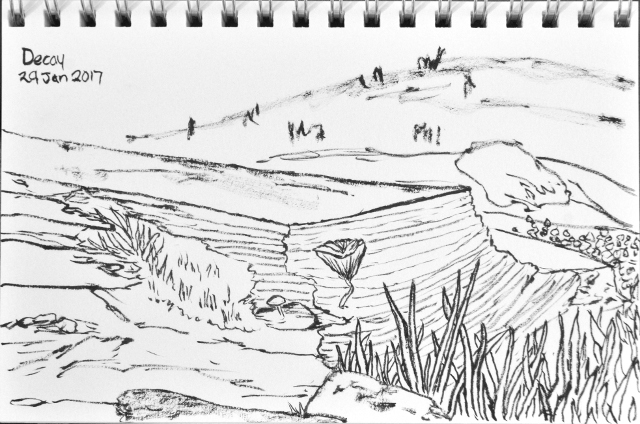 I continued down the coast for another stop at a place rumored to have good tide pools that I would probably not actually visit. 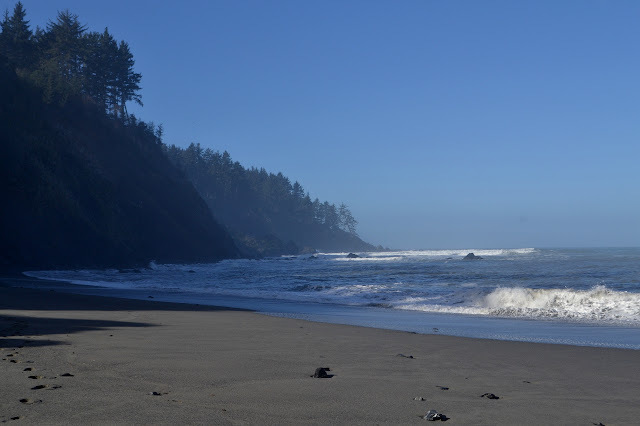 Trinidad State Beach is free to visit and is open sunrise to sunset. I missed the sign for the central parking I was aiming at, so parked in the south lot to get started. There do not seem to be trail signs to get started from, but around behind the bathroom is a very official looking trail dropping down toward Mill Creek below. An initial false start down a rather unofficial trail gets a good view of Pewetole Island. 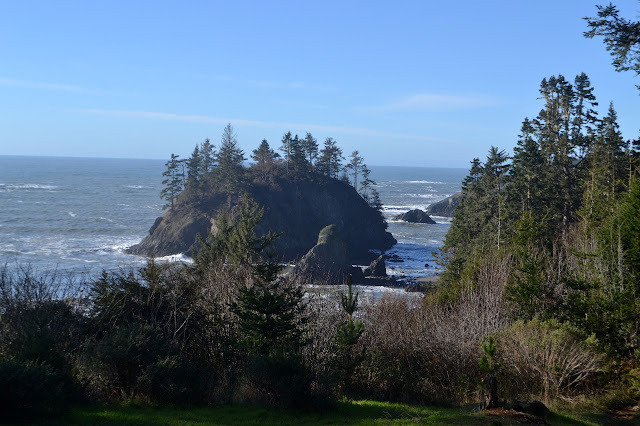 According to Yelp, Patricks Point State Park has some of the best tide pools in the county. It is not a good day for it since the lowest tide is after sunset when the park closes, but I am out to check it out anyway. There is an entry fee for the park, or one can sneak in with the surfers. 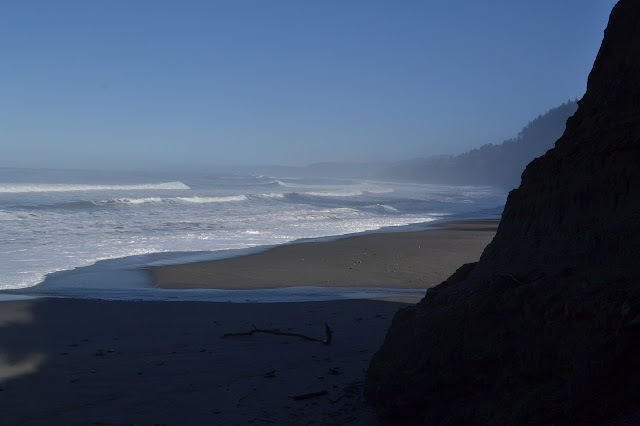 I grabbed some parking along the edge of the road and start down the surfer trail. It is easy to find by the guy with a board practically sprinting down it. It does have a couple extra trails to get a little lost down, but they are short, on the way to a proper trail. It takes me a couple tries to get on the right one, but soon I am on the Agate Beach Trail and may as well wander all the way down to the beach. 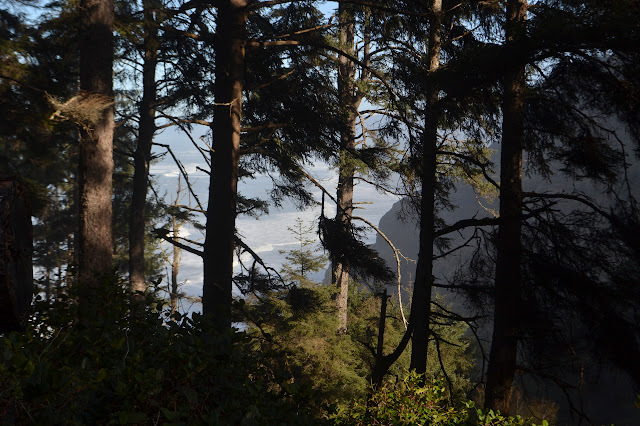 Most of the park is trees on high cliffs above a roaring ocean. There is a bit of beach out here. 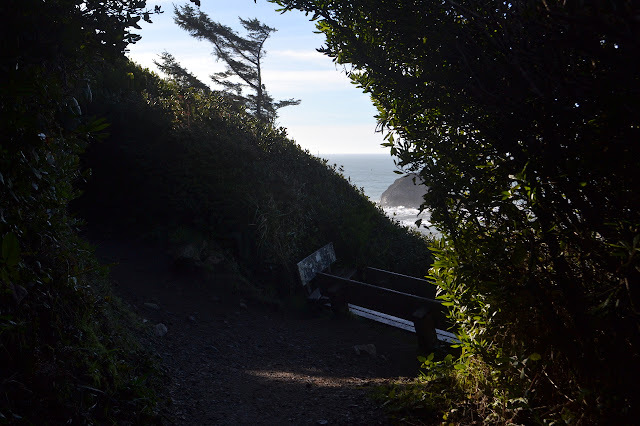 The trail is nice until shortly above the beach where storm waves have taken it partly out. It is built with wired pieces of wood so it will not wash away, but the dirt beneath still goes. 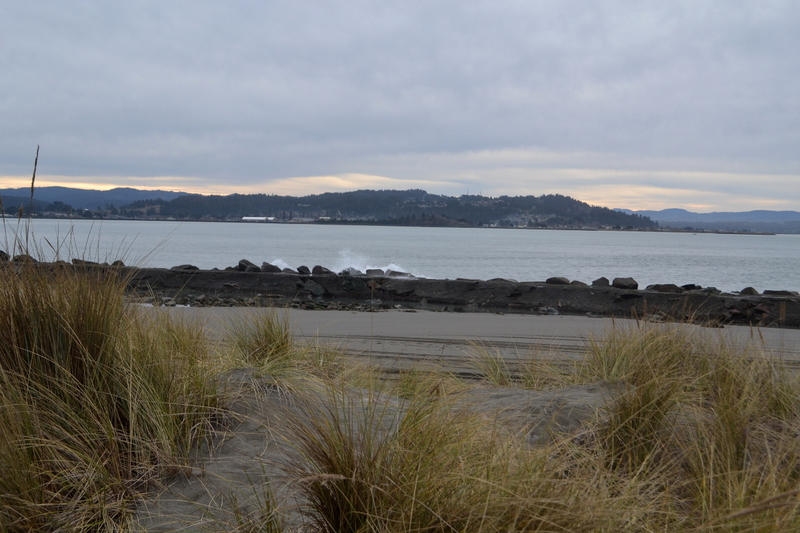 Agate Beach has a course sand on top, but fine sand beneath. It goes on for miles to my right, but finishes in a few hundred feet to my left. Most the footsteps on the beach go off to the left and disappear. The waves are a constant roar with many crashing at once as they come in behind the last. It is a while before I even notice the four surfers out in the bay. They are small black dots on a big ocean. Nowhere to go this way at this hour. 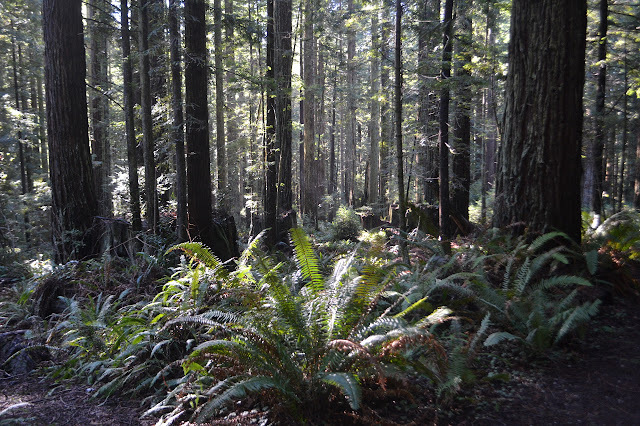 The newer Sunny Brae section of the Arcata Community Forest can be accessed at a turn of the road where a few steps lead into the forest. The houses are left behind quickly as it dives into the trees and starts to climb. It splits immediately into a bike route and a hiker route, but does not stay like this for long. I head up the steps and stop to study the sign briefly before continuing to climb up into the trees. 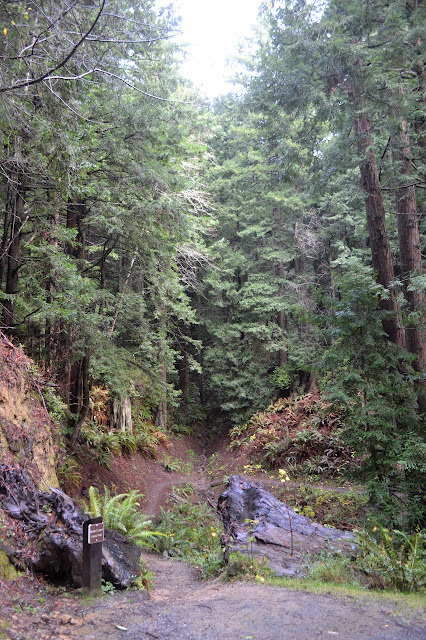 Entering the Arcata Community Forest. A map to the right and the marked split for bikers or hikers to the left. 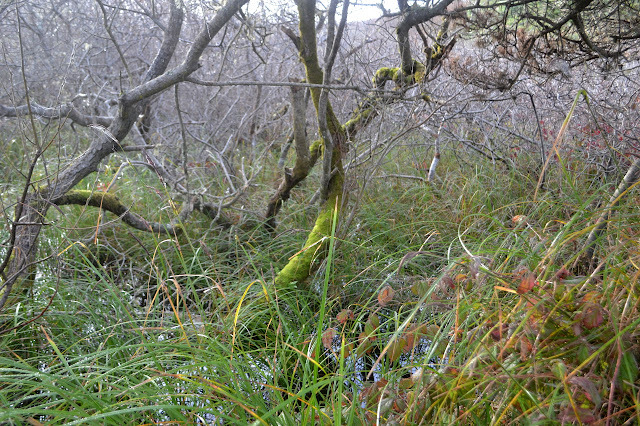 This section of the forest is smaller and there is less possibility of getting lost among the interconnected trails. Mostly what I took in from the provided map is that I can go up and down via different routes, but had not quite got a plan. 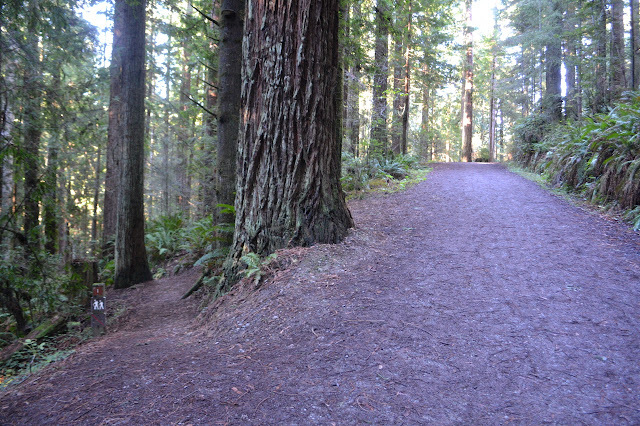 The biker and hiker routes join together into a road that twists upward. The sign for a loop trail to the side is too tempting even if it does not appear to be traveling upward at the start, so I turn to wander its curves. 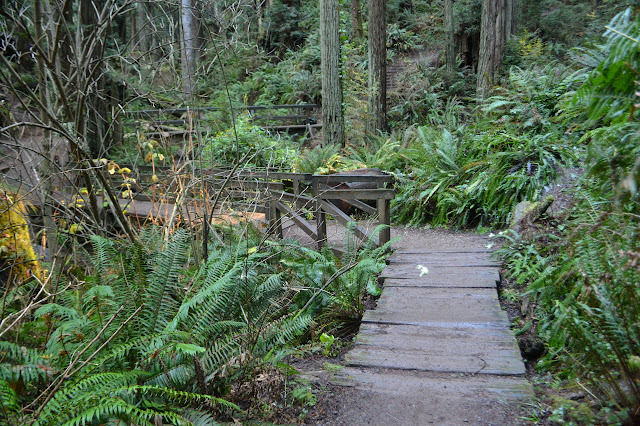 The start of the Beith Creek Loop. And of course there are trees. They are not very big ones, but there are a lot of them. Maybe the Mad River is so called because it wanders northward for a few miles before finally dumping out into the ocean. 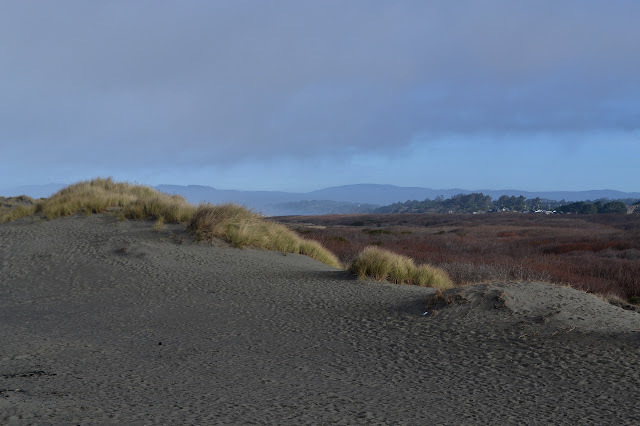 A road along it jogs back and forth along the peninsula formed until there is nothing more than a few sand dunes ahead, then dumps into a sandy parking lot full of big puddles. I find a higher spot for the car and head out into the dunes. They are short and while still near the parking lot, full of the evidence of people in the form of fire rings and footsteps and trash. Except for the footsteps, this quickly tapers off. Out on the dunes. Civilization starts again on the other side of the Mad River. The waves crash five deep not too far from the parking. 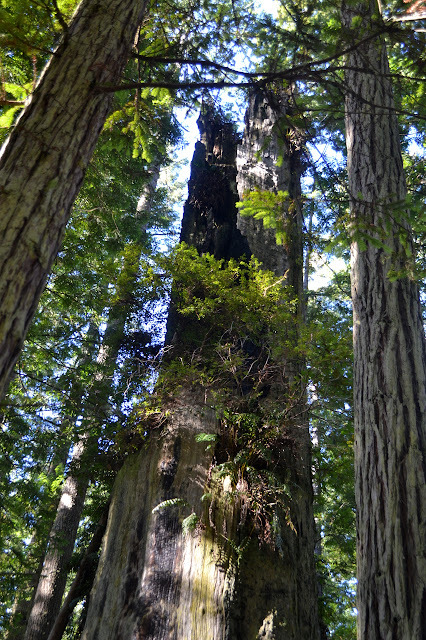 Just outside Arcata is a second growth redwood forest and made it to being one of the 1000 "best hikes" in my old California Hiking book. 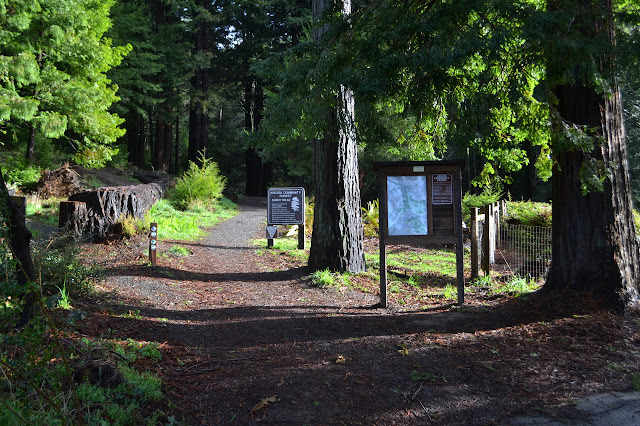 Redwood Park is one of a few trailheads with public parking. 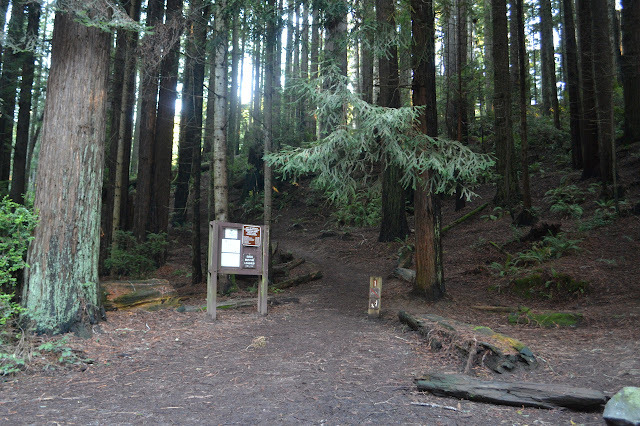 Interconnected trails around the forest allow numerous loops of many sizes. It can also be a good place to get lost, so it is a good idea to pay a bit of attention to where you are going. There is a map at the trailhead and trail numbers are marked at junctions. Starting off trail #1 at the park. 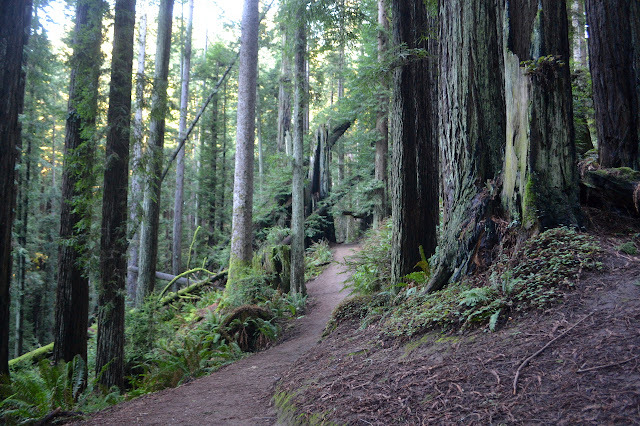 The trail gets quickly deep into the tall trees. From the start, the only sensible thing seems to be to take off up the trail. 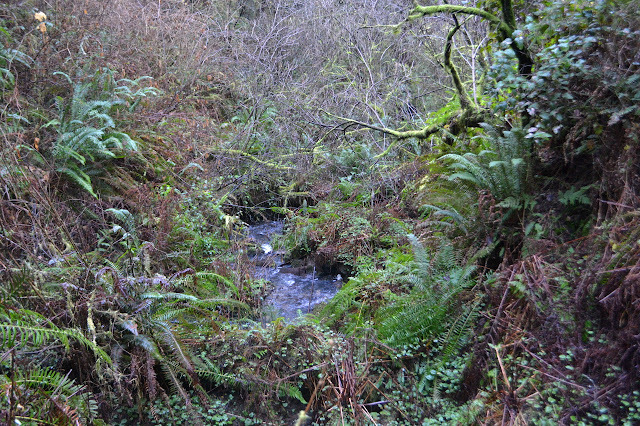 There is a nice creek flowing beside the trail and the trail itself is nicely built. A bit of rough gravel keeps it from becoming a muddy mess where rain is common enough. Bridges to cross the creek when crossing comes up. 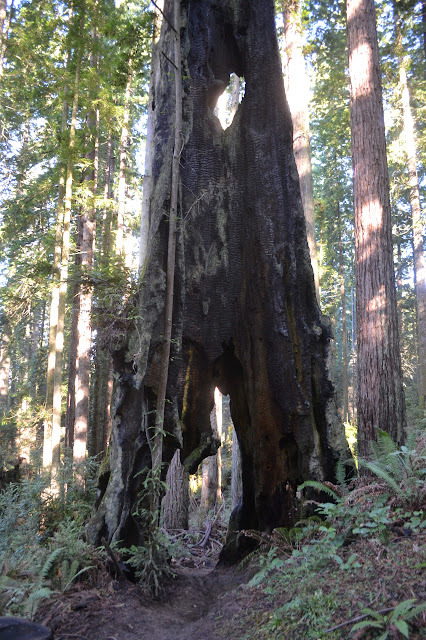 The biggest trees around are stumps, but some of the new trees are starting to challenge them. 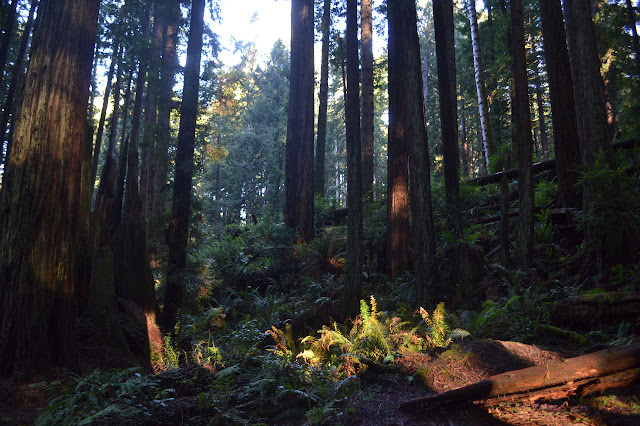 Plenty of ferns under the redwoods. Very little sunlight gets down through the trees. Some of the trails are actually roads and #9 is one of those as I come up to it. Even the old hiking book warns of kamikaze bikers on the trails that allow them. There are none today, though. A nice big road after the bit of trail I was on. 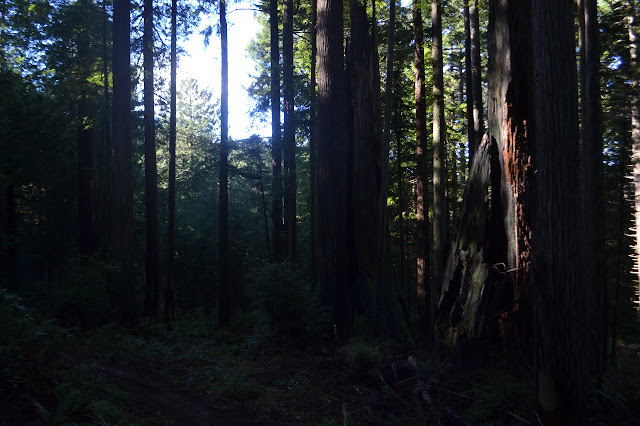 Not all the trees are redwoods. Other try to reach sunlight. 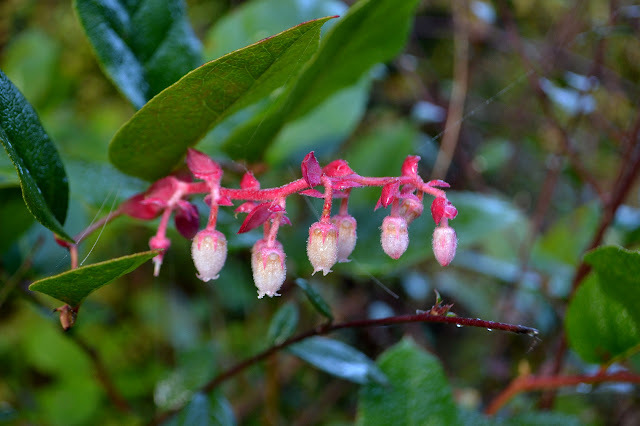 It is hard to find the flowers at the moment, but there are some. After a while on the road, I am a bit tired of it and hoping for a smaller trail. The road splits into two and off on the side is a trail that looks a little bit rogue, but I go for it. It is an odd twisting thing that is clearly popular with the bikes. And finding a bike through tree stump is fun, too. 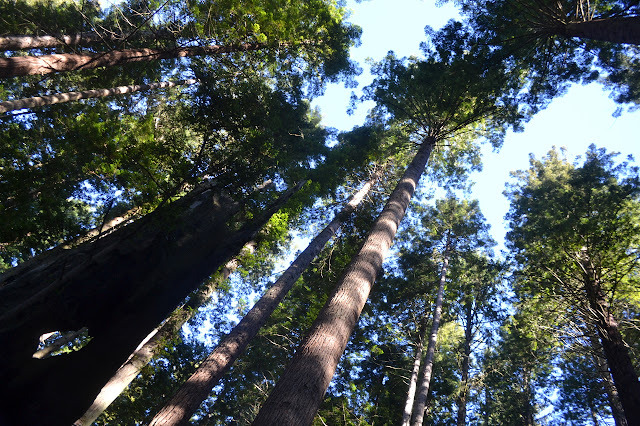 They really are some very tall trees. 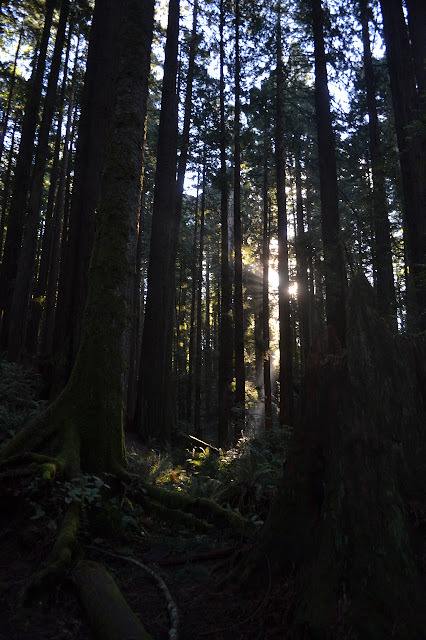 There are some particularly dark spots within the forest where, even though it is sunny, it is very hard to figure out where the sun actually is in the sky. It takes away one usually good input for direction. More forest to wander through. The Ridge Trail looks good, but turning down it does no good. There is a section in the middle that is planned, but not built. It is like a road until a sign that says it is still to be constructed. The green closes in behind the sign. So I turn back and continue up. 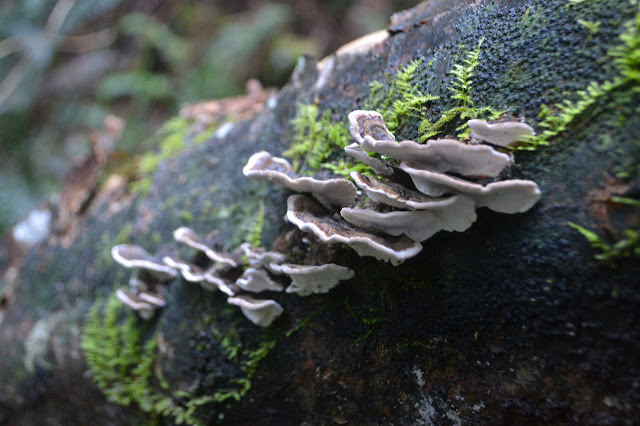 Mushroom shelves built along a log. Turning down a trail, it quickly becomes very steep. 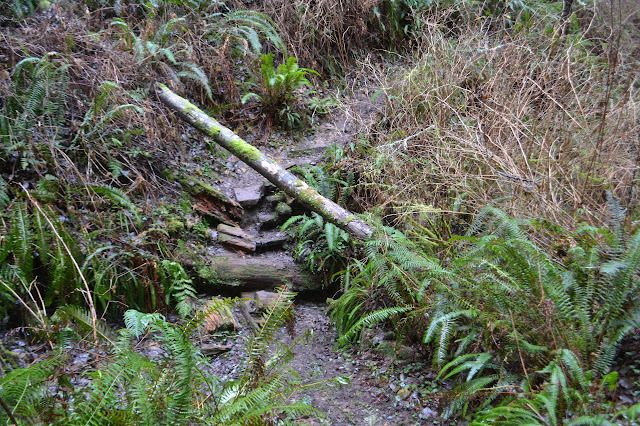 The route up was easy and gradual, but this has big steps held by slick, wet wood rounds. It gets steeper, then ducks under a log and drops into a creek with a step so high, the thin log above becomes a helpful hand hold. 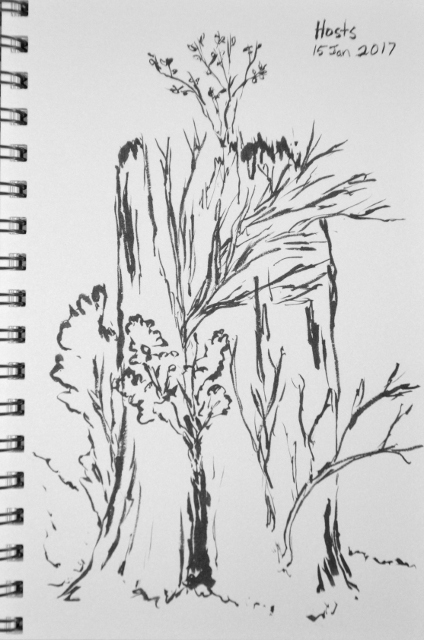 The big stumps of broken trees become planters for the understory. It improves a bit as I wind my way back downward, then drops into more that are more like roads. There are more people on the trails now, and sometimes I take a corner based on which way a noisy group of people go. Seeds starting up a little too early in their pod. 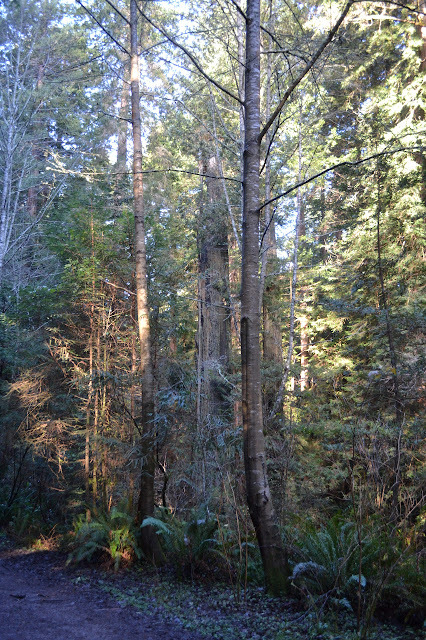 A stand of generally thin trees. 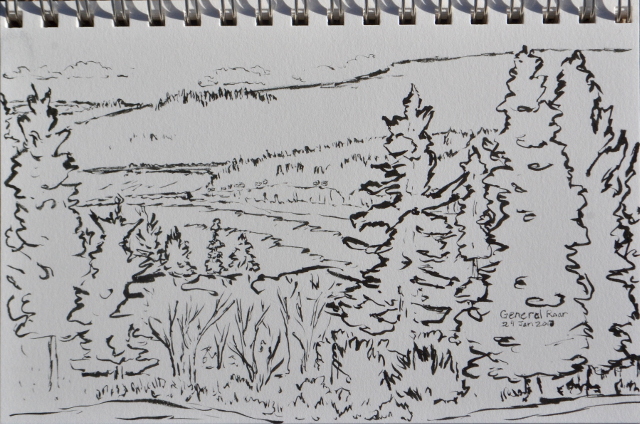 There is a creek and I wander along beside it for a while. Following the water down some more. This is not the same creek as the one I started next to. 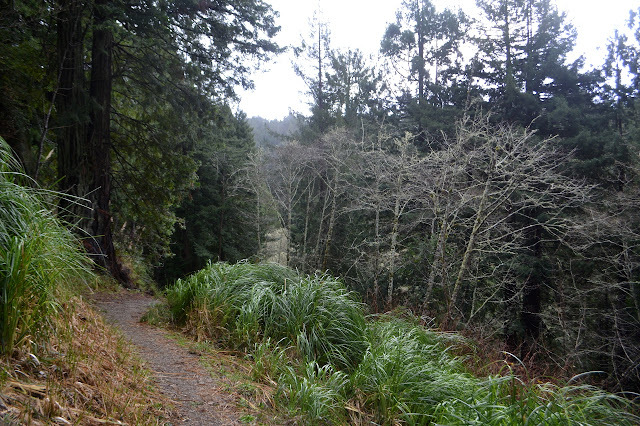 It is making a way down to Humboldt State University instead of the park. There are more and more use trails as I get closer to the college and I start to work back to the park instead of that way. There is a disc golf course along the way and it is quite crowded today. It still seems to be a common area people walk, though. I am happy when I get back into more defined trails. It quickly drops out onto the road a short way down from the main parking area. 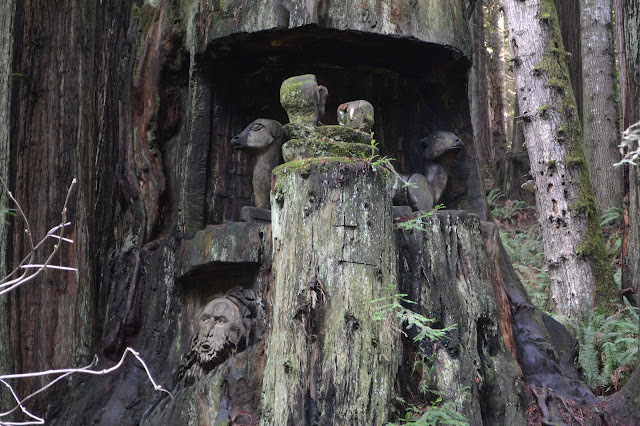 Carvings in a redwood stump beside the road.